Welcome Tweeter people. 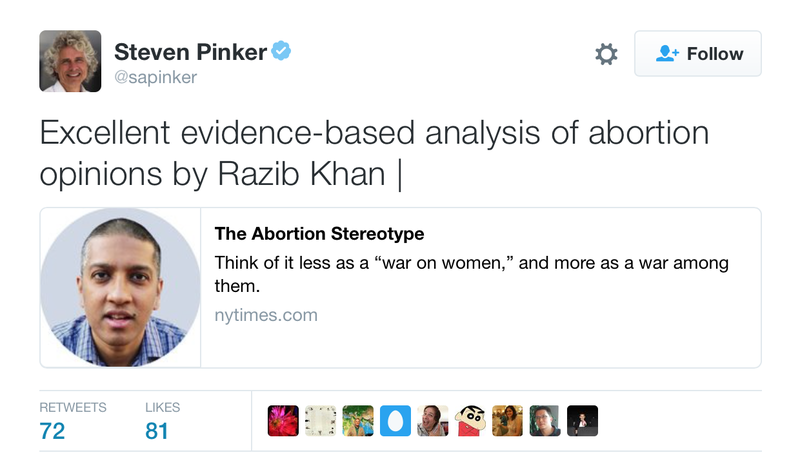 More of my thoughts on Pinker (and evidence of his long-term right-wing beliefs) here. 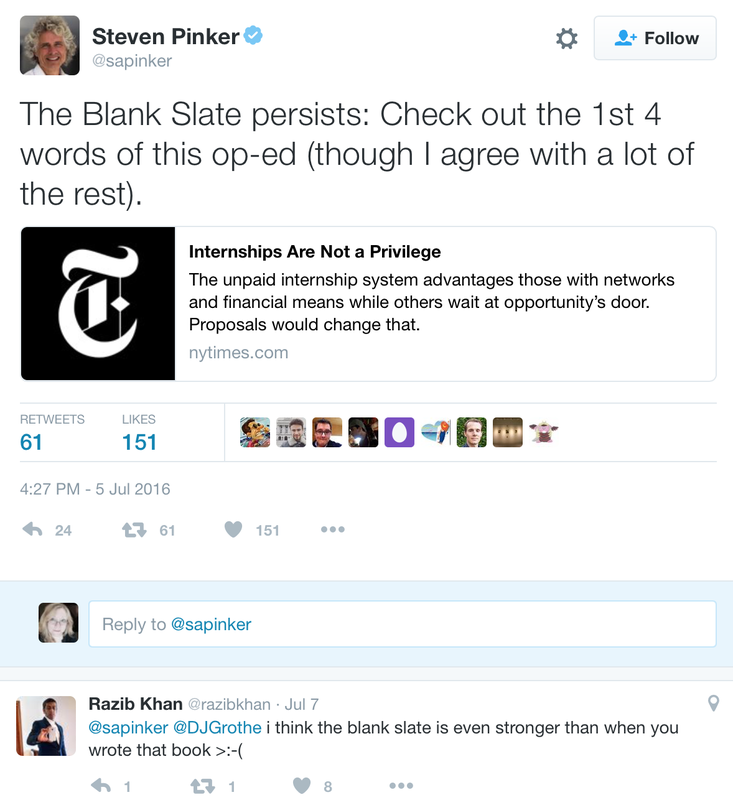 I have long wondered why there is no mainstream media interest in the connection between Steven Pinker, a well-known writer of books about science, history, etc for a general audience and Razib Khan, identified by no less than Breitbart as an intellectual of the alt-right movement. Khan denied a connection to the alt-right, but the White Nationalists know a good source for biology-based justifications for white supremacy when they read it. Khan's long been a big fan of the term "human biodiversity" which is the term racists use to signal the intellectual inferiority of those people who are directly descended from Africans compared to those descended from Africans who migrated to Europe and/or Asia and/or the Americas. "Human biodiversity" has a nice science-y sounding ring to it. Steven Pinker and other proponents of evolutionary psychology have pioneered the standard racist/evolutionary psychologist response to critics of biological essentialism. First, claim the critic is anti-science. If the critic is a scientist, claim they can't be trusted because they have liberal political beliefs. The alt-right knows a good political tactic when they see it. It's hard to say. Thanks to tenure, the people who can't tolerate biological insight into human affairs are still around in the universities. On the other hand there was a lot of support for Summers, which may not have come out a decade ago, not least among Harvard undergraduates (one of them gave me a black-on-red t-shirt with a faux-Che portrait of Larry emblazoned with "Viva El Presidente Summers.") I've found that by and large today's generation of students--black and white, women and men--are far less phobic of biology, and are baffled that anyone could find empirical hypotheses to be too dangerous to study. And then we get the ideology-bashing again. (Coyne quote) Second, it’s pretty clear that the opposition to evolutionary psychology from these quarters is ideologically rather than scientifically motivated. One gets the feeling that research on gender differences shouldn’t be done at all because it’s either designed to repress women, motivated by the desire to do that, or has the likely outcome of promoting discrimination. Well, sexist scientists may try to do that, but I haven’t seen much of that since the Seventies. And gender differences are fascinating. There’s a reason, for instance, why human males are larger and hairier than females, and have more testosterone. Are we supposed to say “You can’t work on that—could have bad repercussions!” Sure, scientific results can always be misused, but I don’t see that as a reason to put up roadblocks against scientific research. After all, what field is more misused and misquoted than evolutionary biology? I am a frequent recipient of emails from Jews trying to convince me to reject evolution because Darwin ultimately caused the Holocaust. Please. Have I ever said that we shouldn’t study gender or racial differences? No. We know there are going to be differences. The catch is that they have to be studied very, very well, with rigor and careful analysis, because they are socially loaded and because science has a deeply deplorable history of using poor methods to reach bad conclusions that are used as ideological props for the status quo. I’m not putting up roadblocks against scientific research; I would like to put up roadblocks to sloppy, lazy ideological nonsense touted as scientific research. I should think every scientist would want that. Pinker is of course a gigantic hypocrite since while he claims scientist critics of EP are motivated by politics he himself is in a bromance with Razib Khan who is paid to be a political operative. More love from Pinker to Khan on Twitter. 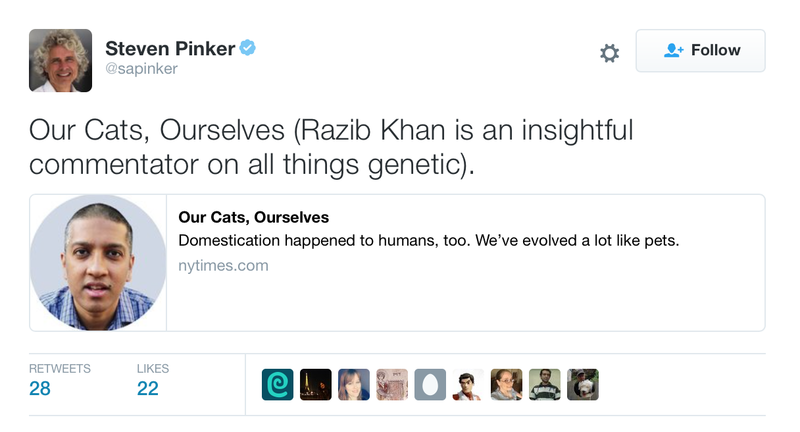 But Pinker doesn't only love Razib Khan. 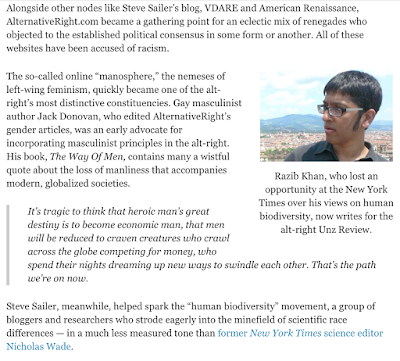 He even uses the work of Steve Sailer, who is quite proud of his racism - Sailer is such a racist that notoriously too-racist-for-Twitter alt-right leader Milo Yiannopoulos thought he coined the term "human biodiversity." I wondered about the basis of Pinker’s conclusion, so I e-mailed him, asking if he could tell me where to find the scientific data that would set me straight. He very graciously wrote me back. He had three sources, he said. The first was Steve Sailer. Sailer, for the uninitiated, is a California blogger with a marketing background who is best known for his belief that black people are intellectually inferior to white people. Sailer’s “proof” of the connection between draft position and performance is, I’m sure Pinker would agree, crude: his key variable is how many times a player has been named to the Pro Bowl. Alongside other nodes like Steve Sailer’s blog, VDARE and American Renaissance, AlternativeRight.com became a gathering point for an eclectic mix of renegades who objected to the established political consensus in some form or another. All of these websites have been accused of racism. Until further notice this is my last post as a blogger at Unz Review. 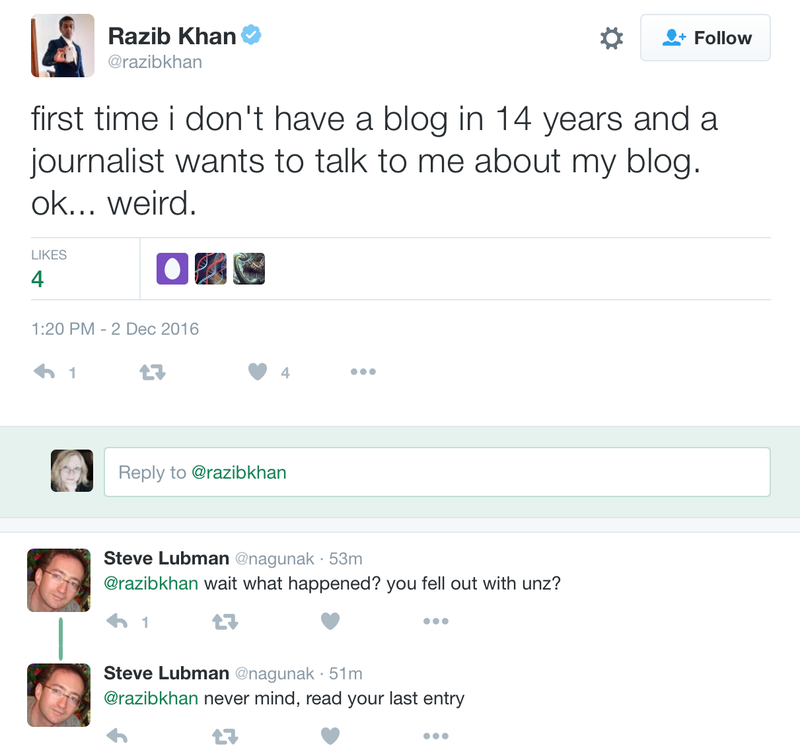 Just as when I left Discover, this shouldn’t impact regular readers very much in terms of substance and content. 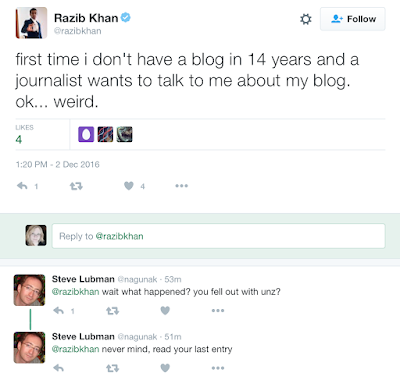 This is probably the same journalist who spoke to me today. More on that later.